I recently got an Ensoniq ESQ-1 for a steal, but it needed some repairs. While repairing it I realized there was one modification that could vastly improve the realtime control of the keyboard: add a potentiometer to control the filter (or any modulatable parameter) in realtime! First I want to give a little bit of help to people who might have to do some repairs. I took the keybed out of the unit several times. Cleaned the small springs and the area that they contact using alcohol. Reseated the connectors on the keybed and the main circuit board. Visually inspected the keybed circuit board. I could visually see which circuits on the keybed circuit board were near the unresponsive keys, so I began checking continuity of the circuits with a multimeter. If you are not familiar with multimeters, you may be over your head here, but you simply touch 2 areas that should be connected in the circuit and it tells you if there really is a good connection between the 2. While I could see nothing wrong, there was a tiny hairline crack on one solder joint of the keybed circuit board in the area of the 8 unresponsive keys, but I could only corroborate the story with the multimeter which showed that there was no connection between 2 points which clearly should be connected. Needless to say, I resoldered the area, and everything worked perfect. There are two types of batteries the ESQ-1 may use. They only differ because of the solder legs. One has 2 legs while the other has 3 legs. This site outlined the process well and I got my battery part number there. I had to make 3 attempts at fixing it simply because I did not check with a multimeter that the 3+ volts from the battery were truly flowing to the main board before I reassembled the keyboard. Cold solder joint was the culprit. This was actually the easiest to repair. There are about half a dozen screws holding the separate display circuit board on, which is surrounded by the larger circuit board which all the buttons and sliders are mounted to for the front panel. If you have flipped the hood of the ESQ-1 you can see the main front panel circuit. Oats which is big and the smaller (paperback book size) circuit board which the display and bezel mount to. Aha, that last one, can be modified. If you don’t have or don’t want to use an expression pedal, you can get a 10k linear taper potentiometer and mount it to front of the keyboard and use it in place of the expression pedal. What I did was wire the potentiometer to both a switch (to enable the circuit) and a female 1/4″ jack that I mounted on the back of the keyboard. This allows me to keep the internal circuitry the same, but when I put a 1/4″ TRS jumper cable (like from a patch bay) from the expression pedal jack to the realtime control jack that I mounted, the knob now works in place of an expression pedal. Within the program, you can assign the “pedal” modulator to many parameters in either a positive or negative varying amount. When assigned to the filter cutoff, you get realtime filter sweep control. I used this schematic as my basis, but I replaced resistor R2 with an on/off switch. 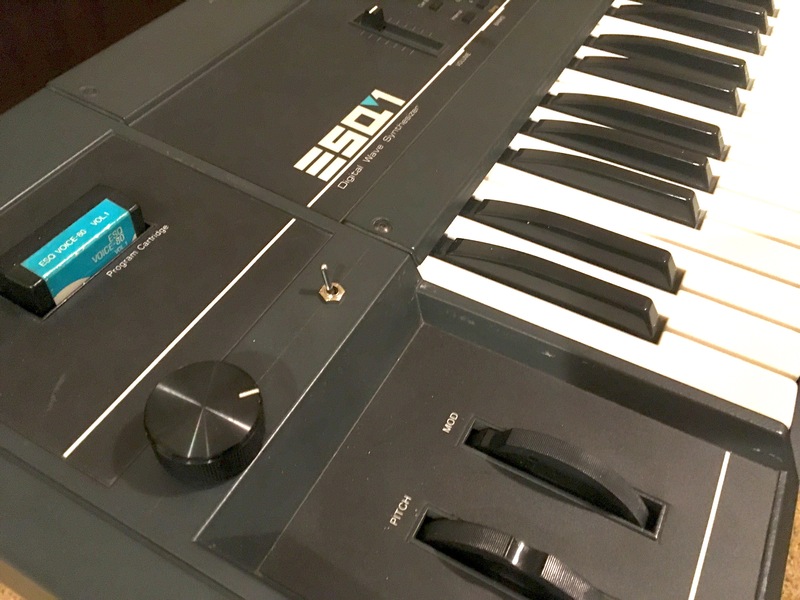 This entry was posted in Tutorials and tagged analog hybrid synth, DIY, ensoniq ESQ-1, filter sweep, mods. Bookmark the permalink.